This Yom Kippur, I'm simply happy and blessed that I'm not spending at home, alone, with a crying baby. I have a husband who is here with us, and that is a gift. I'm reprinting this from 2011 because that year, like this year, was one of epic changes for me. Just a few weeks out from a divorce, I was reflective. This year, I'm feeling quite the same. On a whim, while failing to fall asleep the other night, I decided to read one of the portions of the Yom Kippur reading: Isaiah 57:15-58:14. I was struck by the following, because I think it makes aware something that we probably don't consider when it comes to fasting. In this portion, from 58:14, Isaiah is sharing G-d's words. Call with a full voice, do not spare, like a shofar raise your voice and relate to My people their transgression, and to the house of Jacob their sins. Yet they seek Me daily and they wish to know My ways, like a nation that performed righteousness and did not forsake the ordinance of its G-d: they ask Me ordinances of righteousness; they desire nearness to G-d.
And the people ask: "Why have we fasted, and You did not see; we have afflicted our soul and You do not know?" And HaShem answers with a question about how we fast and why we fast. Behold, for quarrel and strife you fast, and to strike with a fist of wickedness. Do not fast like this day, to make your voice heard on high. Will such be the fast I will choose, a day of man's afflicting his soul? Is it to bend his head like a fishhook and spread out sackcloth and ashes? Will you call this a fast and an acceptable day to the Lord? Is this not the fast I will choose? To undo the fetters of wickedness, to untie the bands of perverseness, and to let out the oppressed free, and all perverseness you shall eliminate. Is it not to share your bread with the hungry, and moaning poor you shall bring home; when you see a naked one, you shall clothe him, and from your flesh you shall not hide? HaShem says not to bow your head and afflict yourself so much as to open your eyes to the true reason we fast, to acknowledge the wickedness and neglect of our people that we pursue day in and day out. Then your light shall break forth as the dawn, and your healing shall quickly sprout, and your righteousness shall go before you; the glory of the Lord shall gather you in. Then you shall call and the Lord shall answer, you shall cry and He shall say, "Here I am," if you remove perverseness from your midst, putting forth the finger and speaking wickedness. And you draw out your soul to the hungry, and an afflicted soul you sate, then your light shall shine in the darkness, and your darkness shall be like noon. And the Lord shall always lead you, and He shall satisfy your soul in drought, and strengthen your bones; and you shall be like a well-watered garden and like a spring of water whose water does not fail. And this part I really like, because it says exactly what we need to do; HaShem doesn't mince words. He's not mealymouthed about what is expected of us. And [those coming] from you shall build ancient ruins, foundations of generations you shall erect, and you shall be called the repairer of the breaches, restorer of the paths, to dwell in. If you restrain your foot because of the Sabbath, from performing your affairs on My holy day, and you call the Sabbath a delight, the holy of the Lord honored, and you honor it by not doing your wonted ways, by not pursuing your affairs and speaking words. Then, you shall delight with the Lord, and I will cause you to ride on the high places of the land, and I will give you to eat the heritage of Jacob your father, for the mouth of the Lord has spoken. It's easy as pie. So often we look to fast days as a means of pain and suffering for our own souls, for our own being. But the truth is that Yom Kippur and its fast are a means of taking our inward obsession outward and to acknowledge the indifference we have to those around us, to the hungry and empty souls that need to be sated, to observe the Sabbath and to make for ourselves a path of repair. I want to wish you all a tzom qal (easy fast), which doesn't mean I hope it's a walk in the park for you, but that I wish that you all have come to a point of inner reflection over these Days of Awe so that when it comes to standing before HaShem and asking to be sealed in the book of life that it means something and that it is more than mere words and wishes, that it is based on introspection and action, so that for HaShem it is easy -- easy to seal you eternally in the Book of Life and to the House of Jacob. 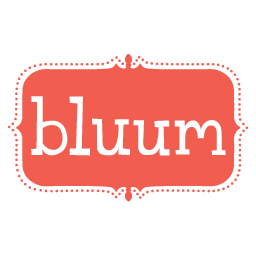 It's that time of year again, the time when the email arrives: Your 10Q are ready! You log in, look at five years worth of responses to a simple set of 10 questions about the year. Your hopes, your dreams, your failings, your triumphs. It's all typed up and locked away year after year after the High Holidays. Five years. I recently posted about how much my life is not where I expected it to be. But that's looking at the long haul of experiences. Clicking on each year and reading my life in a vacuum, what I predicted for the coming year, what I'd experienced in the past year, I realize how short-sighted I live my life. In a way, that's good. Living in the moment, experiencing life on life's terms. I never dream too big, I never dream too far away. I've always been a realist. But this one, this one from last year's 10Q is big. Here's the thing. When I was filling out my 10Q last year, I didn't know that Mr. T was going to be gone for a shocking nine months. I didn't know how much things would speed up. I didn't know how much I would need that connection in order to thrive and just survive. I suppose I achieved what I was missing -- sort of. I spent a lot of time this past year praying and talking to G-d. A lot of time crying, pleading, begging, and reflecting. 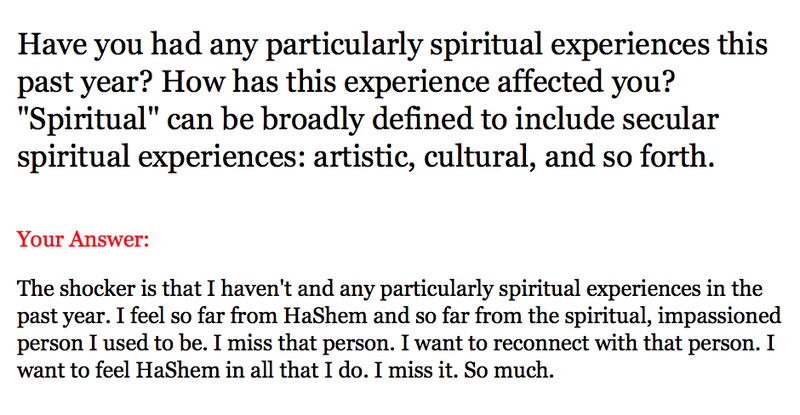 But I still don't completely and utterly feel like the deeply spiritual person I was several years ago after my divorce and moving to Israel. Life's incredibly busy and engaging with that self isn't as easy as I wish it were. But that's the ultimate battle with being a Torah-observant Jew. It's so easy to go through the motions day in and day out. Say a blessing, eat an apple. Go to the bathroom, say a blessing. Get up, cover your hair, observe the laws of modesty. Go to the mikvah, speak Hebrew with your child. Write an article on the origins and meaning of the siddur (Jewish prayer book). What's often missing is the feels. Yes, that's a popular bit of internet lingo at the moment, but the feels are what I've always battled with when it comes to taking my Judaism personally. I'm a cerebral person. I first came to Judaism through the textbook in college. I dove in to a master's degree in Judaic studies with the mind of an academic. I'm no Orthprax, because G-d, whether I spend hours in hitbodedut or not, is very central to my existence and understanding of the world. And the funny thing is, the whole of modern Judaism is based on the deeply academic pursuits of the great rabbis, battling and arguing over meaning, substance, observance. But, for some reason, when I think of the rabbis of the Talmud and the great sages of the Medieval period and the great thinkers of modern Judaism, all I can think is, "Here are some super spiritual people, right?" Who knows. My husband is a Hasid through and through. He's got the feels oozing out his ears and dances around the synagogue on Shabbat and has a joy in his soul that is something I envy. I wouldn't say I'm a mitnaged, the classic thought-based opponents of the Hasidim, as I don't oppose Hasidic thought and I find a lot of it incredibly inspiring and personally valuable, but my natural state is more that of the classic mitnaged than Hasid. I suppose, then, Mr. T and I are creating a balance in a way. I learn from him, he learns from me, and hopefully, maybe, I can find the balance of spiritual seeker and passionate thinker and not feel so far, so rote in my Judaism. Sign up for your 10Q. Bonus: I really need to get back to 2013 and take my own advice. Don't sweat the small stuff -- and it's all small stuff. You have an amazing husband, wonderful friends, and this life is a gift. I've got a lot of books in the hopper, and I feel terrible that I haven't been more speedy in reading and reviewing them, but for some reason, my Shabbat reading schedule has been replaced by toddler placating and napping. But this Shabbat, I managed to nap, dig into The Blind Angel: New Old Chassidic Tales, and even read a bit of Nightingale after putting Asher to bed. The Blind Angel is a great Shabbat read because it's a series of stories, which means you can easily put it down and pick it up without fear of losing the story line. "For twenty-five years, Rabbi Tovia Halberstam, a scion of leading Chassidic dynasties, told riveting Chassidic tales to an audience of thousands on the Yiddish radio in New York. These legends, as precious and rich as family heirlooms, were known to millions of Jews before the Holocaust. Preserved today in their original Yiddish by the Chassidic community, the tales capture a vibrant culture with animated characters, humor, wisdom, human struggle, and moral lessons. In The Blind Angel, Rabbi Halberstam's son, Joshua, renders these tales for a contemporary audience while maintaining the full charm, rhythm, and authenticity of the original tales." 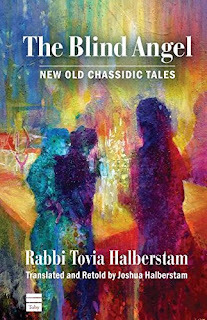 Beyond the fact that I'm a sucker for Chassidic stories, Joshua Halberstam does an excellent job with his translations and providing notes at the back of the book that provide insight into why the story is unique, how it related to the larger Chassidic way of life, and more. Likewise, the introduction provides great insight to Rabbi Tovia Halmberstam and how he managed to become a scion of Chassidic storytelling. I had to read the book's namesake, "The Blind Angel," of course, and I found it to quite poignant. The gist of the story, which will hopefully prompt you to pick up a copy of the book yourself, is that when you perform a mitzvah, an angel is created. But that angel is directly affected by the intention of that mitzvah. In the classic tale, a wealthy man helps fund a poor man's daughter's wedding, but only with the agreement that the poor man give him his most prized possession -- a chanukiyah that was made out of the coins that he had collected from his rebbe over the years. As a result, the angel that the rich man created with his mitzvah was blind, because the act was not pure in intention. Thus, when the rich man died, his blind angel led him ... blindly ... unable to find the door to the heavens. The great rebbe who retells the story in this Chassidic tale rectifies the situation by returning the chanukiyah to its rightful place, allowing the rich man's blind angel to see and find the door. There's a lot more to the story (a sick woman as the prompt for the retelling), but the message is very powerful. 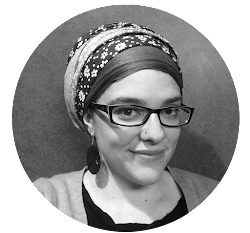 Intention, in Judaism, is so incredibly important. You can do the nicest, most amazing things in the world, but if you're only doing it to serve your own interests, you're going to have a crowd of blind angels unable to lead you into shamayim when you die. The thought of that is horrifying, isn't it? I read another story, called ... well, honestly I don't have the book in front of me, so I can't tell you, but it was about the role of dancing in Chassidic life. Now, my husband is a Chasid, through and through. 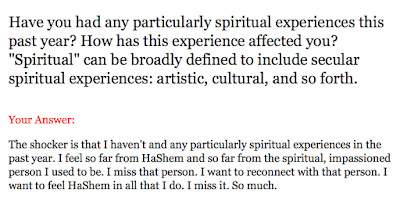 I wouldn't categorize myself as such, but that doesn't mean I don't appreciate the belief, the thought, the joy that comes with Chassidic living. A way of life that is filled with a focus on joy and happiness, I find it a bit of a struggle to live every day with utter joy. My husband is pretty amazing at this, and, of course, it's something I strive for, but I don't get down with the dancing aspect of it all like Mr. T does. I'm not the singing/dancing type when it comes to my Judaism. That being said, this story really hit home for me (especially in relation to yesterday's post). The story is about a Chasid who becomes incredibly successful and at the gatherings that his rebbe hosts he ceases to dance. Everyone dances around him, but his feet are glued to the floor. The rebbe calls to him and asks him what's up and he says that he has a lot on his mind, a lot to focus his energies on. Then the rebbe tells him a story: Once upon a time there was a great king, with many riches. He had to go away and needed someone to watch his riches of him, but he was hesitant because he didn't want anyone to steal from him. At the end of the guard duty, the individual would be rewarded handsomely, but he didn't want the individual to steal from him while working. So his advisor suggested a plan. They'd call upon all the men of the town to come and walk through a dark corridor filled with gold and silver coins. After all the men had gone through the corridor, the king asked them to get up and dance. Only one man was brave enough to do so. Why? The rest of the men feared the coins jingling in their pockets. The rebbe told the Chasid that life is like one long corridor filled with shiny appealing objects. But if you fill your pockets with it all, you forget to dance and experience the joy life has to offer. Both of these stories have so much value to offer, small messages that manifest themselves in huge, meaningful ways. That's one of the reasons I love Chassidic stories. You're not always sure where they're going, but once they get there, the lightbulb clicks on and you feel enlightened and uplifted. What do you think? Will you try and pick up this book for your own collection?